California State Lottery Headquarters — Sky Rider Equipment Co. The six story California State Lottery Headquarters began construction in 2009 and was completed in July 2011. 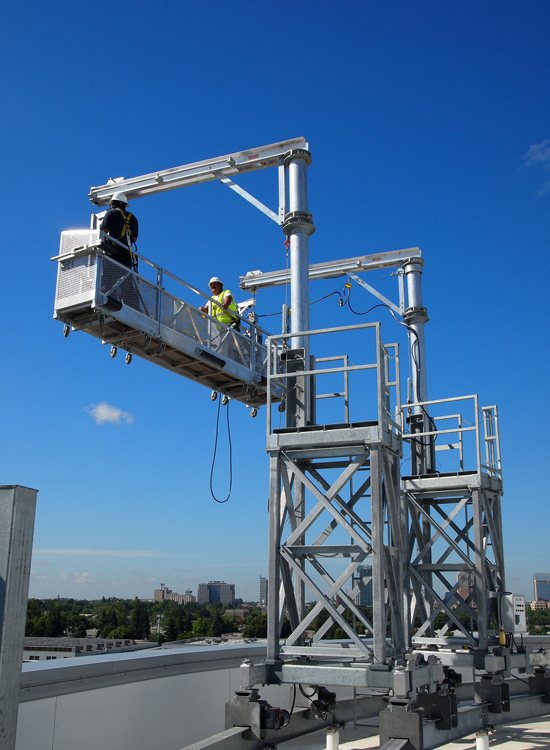 Sky Rider was chosen as the window washing equipment contractor. Several design challenges are evident as one looks the photos of the building. Among them is the all glass architectural wall extending 14 feet above the main roof on the East and South elevations. 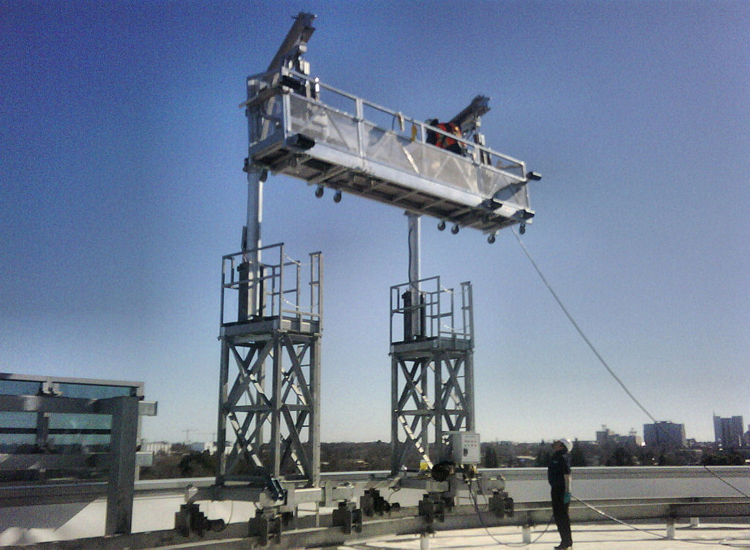 Access from a catwalk was ruled out, as was a BMU, as cost saving measures. 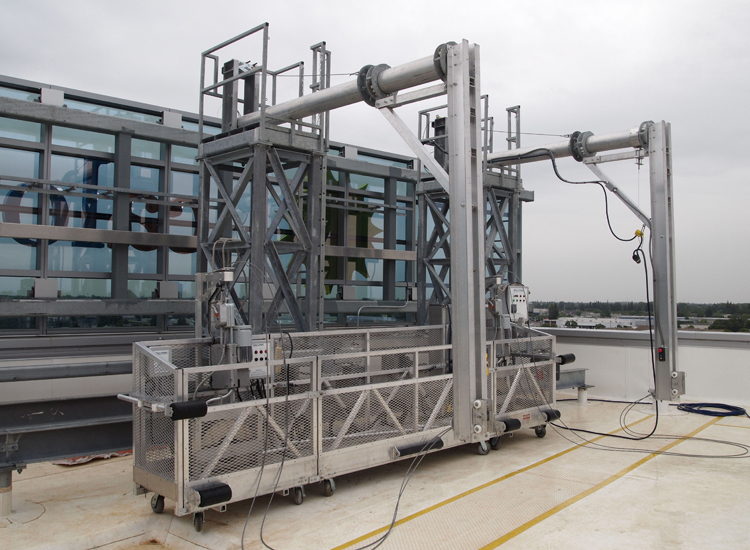 Accordingly, Sky Rider installed a track system on embedded pedestals to support a pair of powered carriages of sufficient height to clear the glass wall. Additional cost savings for this method is that the Self-powered platform is also used on the system of portable sockets and davits on the North and West elevations. Sky Rider first installed the Pedestals (left) onto the roof structure. With the roof slab poured, we were then able to install the prefabricated track. (Above). With the track in secured place, assembly of the Carriages began. The Carriages and Self-powered platform is shown here in its stored position. With the Davits lowered, the Platform may be disconnected and is free to roll into position on any of ten work positions using portable Sockets and Davits on the North and West Elevations. With assembly completed, a full operational test was performed at each work position, including Davit locations, before turning over to owner. The Powered Platform section of this website may be reviewed for consideration of the many features utilized in the construction and performance of our Powered Platforms. An important feature of the Carriages used in this system is the use of Variable Frequency Drives (VFD’s) to control the traversing motors. VFD’s were utilized primarily to allow the carriages to accelerate and decelerate at a predetermined rate to avoid the otherwise uncontrolled movement of the Platform in an instant start/stop condition.